Hello all, Summer is here and that means it’s time to get back up into the mountains! A warm spring has resulted in a rapid snow melt and most of the GDT is snow-free earlier than normal this hiking season. Plans are confirmed for our GDT Trail Maintenance Trip taking place from July 15 to 19 on the Aldridge Creek trail. We are partnering with the Hornaday Wilderness Society to repair damage to the trail caused by the floods of 2013 and re‐establish the GDT from Aldridge Creek trailhead to Fording River Pass. Our trail crew filled up quickly again this year so thanks to everyone who has volunteered to come out and help! As many of you know, the Great Divide Trail closely follows the continental divide between Alberta and British Columbia, crossing the divide no fewer than 30 times during its 1,200 kilometre journey. It begins in Waterton Lakes National Park at the Canada-USA border (where it connects with the Continental Divide National Scenic Trail in the US) and ends in Kakwa Provincial Park northwest of Jasper National Park. The Great Divide Trail is one of the most spectacular and challenging long‐distance trails on the planet. Maintaining this trail is a very exciting project as well as a monumental task. Originally envisioned by the Girl Guides of Canada in 1966, the concept of the Great Divide Trail gained support of both the Alberta and federal governments in the 1970s. But as of today, even though many government departments and organizations informally recognize the Great Divide Trail, it is still not officially designated. SO WHAT DO WE NEED IN ORDER TO GAIN OFFICIAL STATUS FOR THE GDT? Unfortunately, the answer to that question isn’t simple but it will likely involve provincial and/or federal trail legislation (something akin to the National Scenic Trails Act in the USA) and the support of dozens of land management jurisdictions. Sound daunting? Well that is what the GDTA has been passionately working on for the past few years… and we are making progress! The Great Divide Trail is appearing on more and more maps and websites and we are working closely with the Alberta government to incorporate the GDT in the South Saskatchewan Regional Plan. Movies like ‘Wild’ with Reese Witherspoon and the soon to be released film a ‘Walk in the Woods’ with Robert Redford and Nick Nolte have pushed long distance hiking into the spotlight and interest in the GDT is higher than ever this year with a record number of prospective thru-hikers. MEC has again financially sponsored the GDTA; The North Face is in the second of a 3 year funding commitment with the GDTA; and for the first time, the Yellowstone to Yukon Conservation Initiative has sponsored us as well. With the support of these partners, the GDTA is planning seven trail maintenance trips this summer, which will be the most we have ever done in a single year. We are also hoping that the change in provincial government will be positive for garnering official status for the trail in Alberta. The winds of change are in the air but there is still a lot of work for us to do before the GDT will be officially recognized. The Great Divide Trail creates the opportunity for people to experience the wilderness of the Canadian Rockies without imposing on its natural capital. We believe that section-hiking or thru-hiking a long distance trail is of great value to Canadians. Hiking a grand wilderness trail like the Great Divide Trail inspires people. It connects them with nature and builds their appreciation for the wilderness. People won’t protect what they don’t care about, and they won’t care about what they haven’t experienced. The Great Divide Trail creates the opportunity for people to experience the wilderness of the Canadian Rockies first hand, introducing people to the magic of the Great Divide without imposing on its natural capital. We feel it is important to keep our population connected with nature to ensure its long term survival. But the trail is about more than mountains and rivers, it’s about people like you! Together, we share a common vision: the completion and long-term preservation of the Great Divide Trail. By becoming a member or sponsor of the Great Divide Trail Association, you are supporting the trail experience that you love and becoming part of the legacy of the Great Divide Trail. Learn more about membership and volunteering with the Great Divide Trail Association. 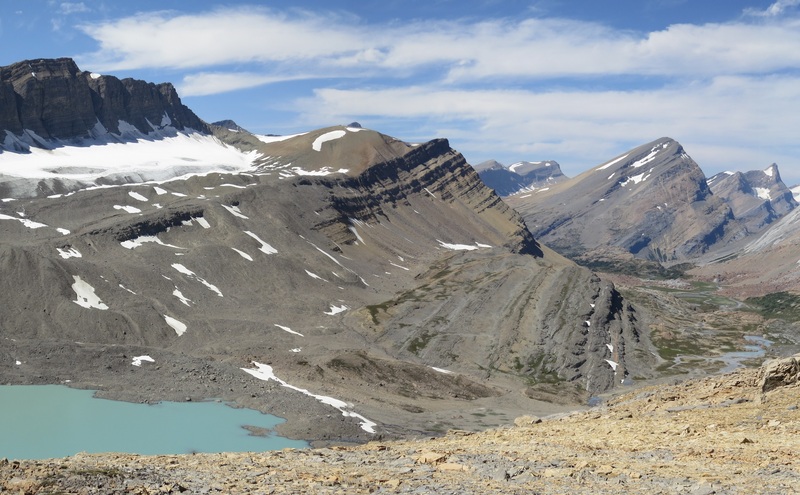 When you are hiking Section 10 of the GDT (see Hiking Canada’s Great Divide Trail) you will be impressed with not only a superb trail, but the sight of BEEHIVE MOUNTAIN. It is named because of what it resembles and not to be confused with another beehive shaped peak in the Rockies, The Beehive, which one can see from Lake Louise, Alberta. 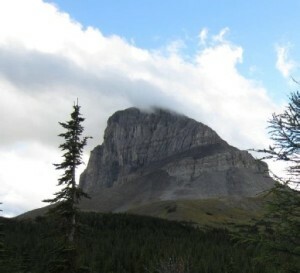 Beehive Mountain is located on the continental divide in the aptly named Beehive Natural Area, rising to 2,895 metres on the eastern buttress of Windy Pass in the High Rock Range. Beehive Mountain was named by George Dawson, one of the most outstanding scientists that Canada has produced. He was a very short, cheery man with chronic ill health (he was the size of a twelve year old as a result of tuberculosis of the spine) but neither stature nor sickness stopping him from charting in the utmost detail available at the time, most of Western Canada. His native guide called him “Skookum Tumtum” meaning brave, cheery man. At the age of 25 his scientific reputation was sealed with the publication of his ‘Report on the Geology and Resources of the Region in the Vicinity of the 49th parallel from the Lake of the Woods to the Rocky Mountains’. Beehive Mountain appears on the map he made in 1886 following this work on the Government of Canada Survey of the Canadian Rockies (Peakfinder.com June 2015). The first person to ascend Beehive Mountain was Morrison P. Bridgland in 1913. He was a surveyor in charge of the federal Department of the Interior’s Dominion Land Survey crews in Revelstoke, Crowsnest Pass, the Kootenays, Waterton, and Jasper. The Great Divide Trail Association Annual General Meeting will be held on Tuesday, September 29 at 7:00pm in Calgary, Alberta; location to be confirmed. Further information will be posted on our website once available. Anyone planning to hike on the GDT this year, please let us know if we can be of assistance with your trip-planning or if you are blogging and would like to share your journey on our website. Check out our Trip-Planning Resources for maps, trail conditions, resupply information and much more. We’re happy to help!